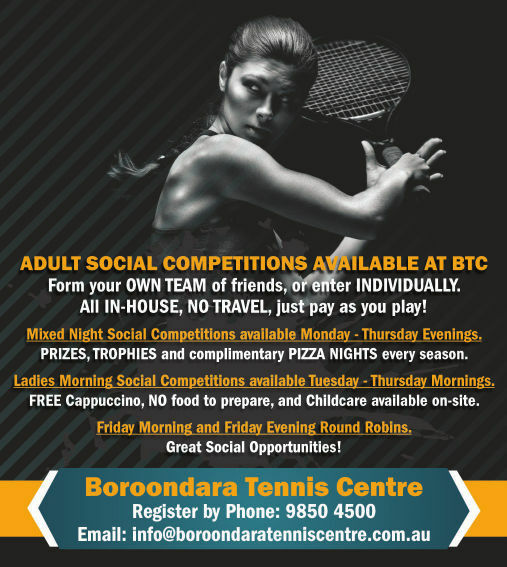 Boroondara Tennis Centre January 2017 Newsletter. Tennis Hot Shots is the official Tennis Australia starter program for young players aged 4 to 7 years of age. By using smaller courts, racquets and low compression balls the program makes learning tennis easy for new players. "Our Aim is to make our athletes physically and mentally stronger than their opponents, in an enjoyable & positive atmosphere." Get a taste of what it is like training like a professional tennis player. High-intensity drilling and hitting, fitness and match play. We have a range of different coaches with elite international experience who achieved world rankings in their careers. Our coaches give expert advice on training program's, match tactics, discipline needed at the highest level and tournament planning. The training squads are run Monday to Thursday nights 5.00-7.00pm. They range from post-juniors to 12 years of age. They are held on the Australian Open grand slam surface Plexi cushion. You will also receive a free training shirt on enrolment. Adult lessons are held week mornings, Sunday morning, and Monday through to Thursday evenings. All lessons run for 1 hour, with a maximum of 4 students per class. We also have childcare available for morning classes on most days. The Centre caters for the total beginner through to the advanced level player in the group coaching sessions and, therefore, those enrolled are grouped according to standard to maximise the learning potential of all concerned. Cardio Tennis is a new and exciting group program featuring drills to give players of all abilities and fitness levels an ultimate cardio workout. 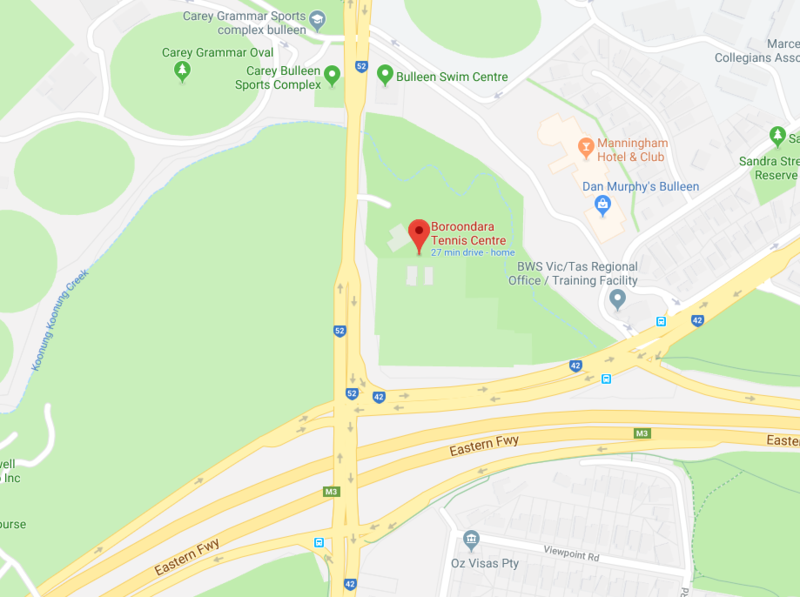 Under the guidance of a Boroondara Tennis Centre coach, each Cardio Tennis session includes a warm-up, cardio workout and cool-down phase. Designed to complement, rather than replace, your traditional tennis classes, Cardio Tennis offers a new way to get in shape and burn calories, in a fun, social atmosphere. Cardio Tennis is a total body workout that features on-court warm-ups, intensive cardio session and cool down. It’s a fun group activity, featuring drills and games to give players of all abilities the ultimate high-energy workout. With use of the supplied heart rate monitors, the coach can monitor and target the intensity of your exercise to get the most from your workout. Monday to Thursday Night Comps starting back now! New season of Wednesday Night Adult Social Comp starting Jan 2017! Come and play in our new season of Wednesday Night Adult Social Competition. It’s all about bringing together diverse standards to promote participation and fitness. This competition is open to everyone who would like to participate in a competition that is not all about winning but promoting rallies and participation with very diverse standards. This competition will not suit everyone. Playing to the median standard is necessary to promote rallies. Drilling the net player, slamming winners, consistent aces and winning to love is not what this competition is based on. • Maximum age: No limit – embracing ACTIVE AGEING!